The $22 million Inner Loop East Transformation Project in Rochester, New York, has received the Envision® Silver designation for sustainable infrastructure. To reach Silver status, a project must demonstrate that it delivers a range of environmental, social, and economic benefits to the host and affected communities. The Inner Loop renovation is the first Envision-recognized project in Rochester and the third in New York State. Work on the Southeast Quadrant of the Inner Loop involved bringing to grade a recessed expressway dating back decades to flawed urban transportation policies that cut vibrant city sectors into pieces. The reclaimed footprint has been replaced with a new community-scale, urban boulevard vastly more beneficial to the neighborhood and in line with master plans designed to “right-size” city streets. The newly re-constructed Union Street supports two-way vehicle traffic, a protected cycle track, improved pedestrian amenities, new landscaping, and is designed to incorporate future residential and commercial growth as well as transportation infrastructure. “Stantec is very proud of this Envision Silver verification. This visionary system recognizes the very positive social and environmental impacts of infrastructure renewal. This is particularly true in urban cores, places where we see extraordinary potential to strengthen and support communities,” said Jim Hofmann, Stantec principal and project manager for the Inner Loop transformation. The Envision system examines the impact of sustainable infrastructure projects as a whole, through five distinct categories: Quality of Life, Leadership, Resource Allocation, Natural World, and Climate and Risk. These key areas contribute to the positive social, economic, and environmental impacts on a community. The City of Rochester, Stantec, and the New York State Department of Transportation worked in close collaboration to deliver this award-winning sustainable project. More than 300 jobs were estimated to have been created during the three-year construction period. Also, the reclaimed land offers new public spaces and the potential for vibrant street-level retail associated with new residential development. A recent market analysis found that the land value would be between $8.5 and $11 million and could add between 428,000 and 795,000 square feet of mixed-use development. 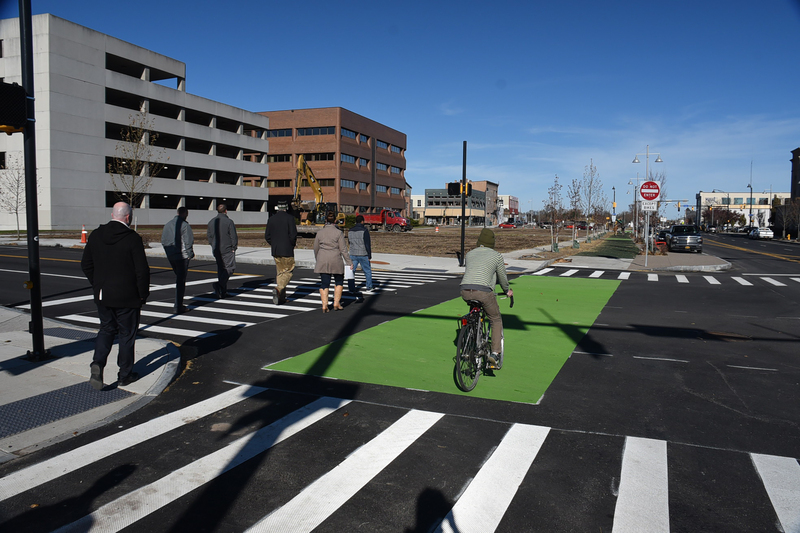 Recreational capacity for pedestrians and cyclists is also greatly expanded, with the addition of a protected two-way bicycle lane (1st of its kind in Rochester, New York), curb ramps, ample public seating, safer crosswalks and new planted trees and greenery. Rochester’s downtown core is now more accessible, improving quality of life for residents, workers, and visitors. The fundamental vision for Rochester’s City Center is to create an urban community of lively streets and public spaces to make the city a more desirable place to live, work, and visit. To this end, all projects, including the Inner Loop East Transformation project, are evaluated according to how much they contribute to this vision. Since 2000, Rochester has undertaken extensive public consultations to chart the future of its downtown. The depressed highway section of the Inner Loop East had been consistently identified as a significant physical barrier to community cohesion, livability, and accessibility to the downtown core. The Inner Loop East Transformation project fills in the below-grade section of the expressway and replaces it with an at-grade complete street suitable for pedestrians, cyclists, motorists, and transit users. Streets and sidewalks make up a significant amount of public space and the city rightly prioritizes investments into well-designed, multi-modal thoroughfares. The Rochester Inner Loop East Transformation project includes a tree-lined buffer between the vehicle roadway and a two-way cycle track, and another treed strip between the cycle track and the widened sidewalks. This not only enhances public space, but it also improves safety and security for motorists, pedestrians, and cyclists. The industry standard for street lighting in New York state is high pressure sodium (HPS) vapor lamps which account for 89% of all existing street lighting in the state. The original lighting design for the Rochester Inner Loop East transformation project adhered to this industry standard, calling for HPS fixtures along the new street. However, the City of Rochester completed light emitting diode (LED) street lighting trials in other parts of the city and determined these more energy-efficient fixtures would meet safety requirements. The project revised the lighting component of the design as a result of this study, calling for LEDs instead of HPS fixtures, resulting in a 51.6% reduction in annual energy consumption for the project.